The cord organization project was a subset of a larger organize the 3 utility drawers project, but I felt it was worthy of its very own post. 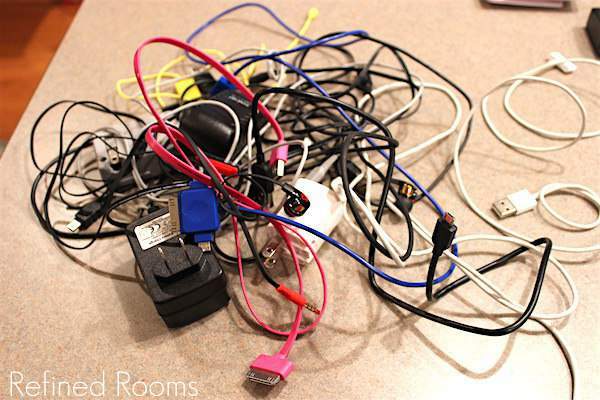 The first task was to gather up all of the cords into one giant heap on the kitchen island. I then gathered my family members and together, we went through each cord one-by-one and identified what each one belonged to. Although most of the cords were for charging iphones/ipads/ipods, there were also designated chargers for a bunch of electronic kid toys and handheld gaming systems. 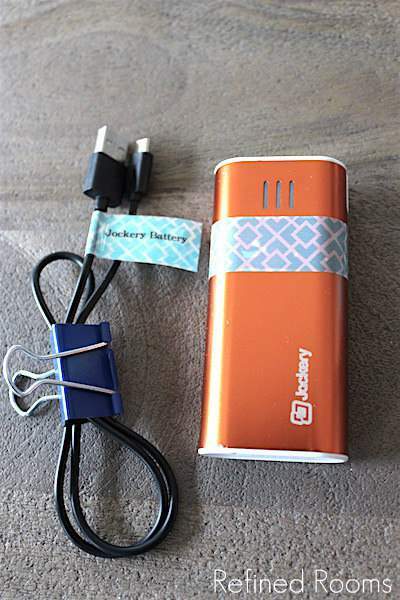 To make matters worse, every single one of us received a portable battery charger for Christmas (so that we could stop fighting over who gets to use my husband’s charger when we’re traveling). That alone added 4 more chargers to the mix. 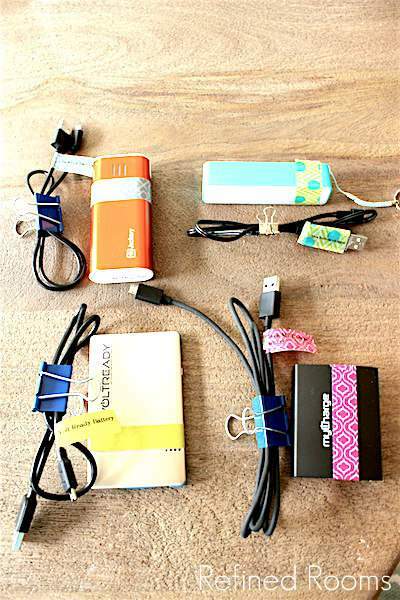 You may have guessed from my previous cord organization post that washi tape would come into play during this organizing project. And you would be correct! Once we knew what each cord was used for, I grouped the cords by who uses/owns it. For example, my daughter’s pile consisted of the charger for her 3DS, her new drone, her Zoomer dog toy, and her new battery pack. 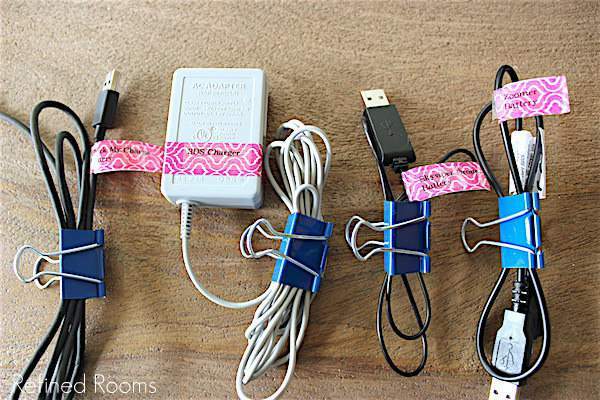 I then used washi tape to color code the various household cord owners, then pulled out the trusty label maker and used it to identify the device to which the cord belongs. Ready to check out the drawers now? 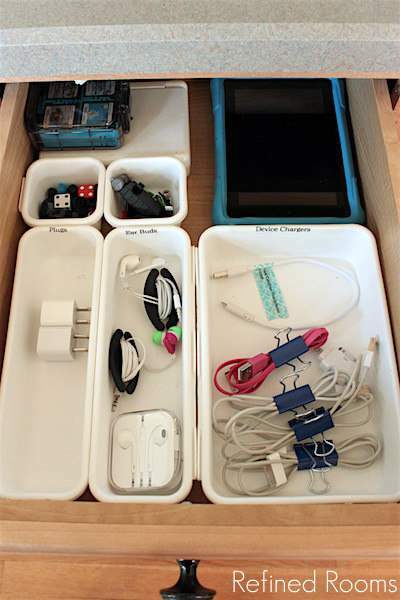 Notice how I labeled the various drawer compartments in the hope that everyone will put items away in the right place? Time will tell. 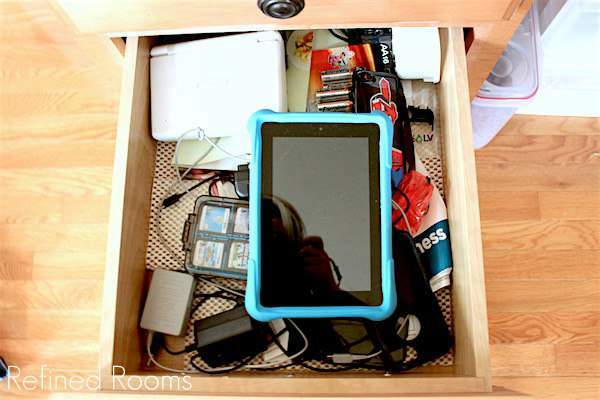 Even if they don’t, I can always assign “drawer clean up” as a monthly chore for one of the kids, since they can easily figure out how to reorganize the drawer if need be. 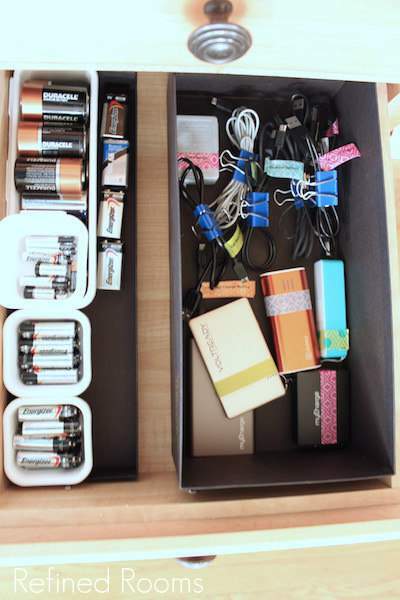 In the 2nd drawer, I used the remaining containers from the drawer organizer set combined with a shoe box and a gift box lid to set up the two main zones: batteries (as in Energizer & Duracell), and portable battery chargers/cords + all other charger cords. 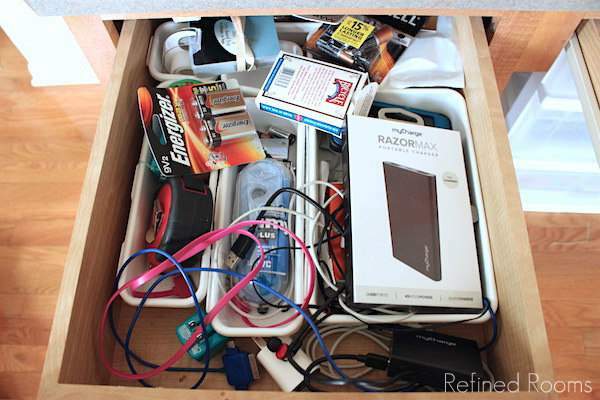 Other items (e.g., card decks, tape measures) that used to live in these drawers were relocated to the central drawer as part of the larger utility drawer organizing project. This project took about 1.5 hours to complete and it has made such a difference! I do a little happy dance whenever I open these drawers (which is several times a day). I love this! My husband is very strict about cables but for some reason, he doesn’t care that the kids have lots and lots of cables disorganized in their drawers. I asked him the other day do we need this cable for a Bluetooth keyboard and he said it’s the same as the other micro USBs. No help whatsoever. I do have rolls of washi tape and binder clips. I think I am going to do what you did with the cables and show the kids how to manage them. Let’s see if that works. Thanks for sharing these great ideas. You’re welcome Sabrina. Be sure to let me know how it works for your family. 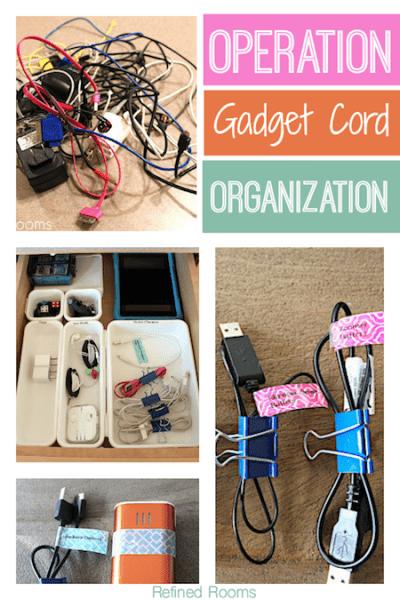 Of course, the trick is to get them all in the habit of reattaching the binder clips when putting cords away. We are working on that right now! Nice one! 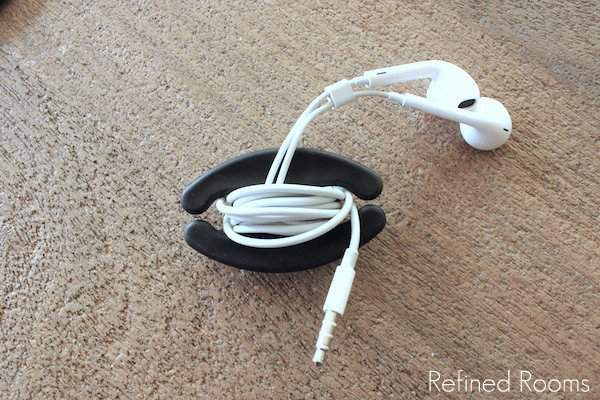 Cord decluttering is going to be one of my daily challenges, and this is exactly the result I’m hoping people will have. Love the washi tape idea!